As Valentine's Day is quickly approaching, Go Organically Fruit Snacks wants to get you and your family in the spirit with some ideas for creative and unexpected expressions of love. Can you feel cupid getting ready to draw back his bow? Valentine's Day is almost here! And while we love flowers and heart-shaped boxes of chocolate as much as the next person, we think there are so many other fun ways to celebrate the season of affection—especially with little kids around. So gather up the family and get ready to be creative this Valentine's Day with these unexpected expressions of love. Themed foods are always a big hit with kids...and let's face it, parents too! Start off the day with heart-shaped pancakes. You can either eyeball the shape yourself or place a heart-shaped cookie cutter on your griddle for a more perfectly-formed heart. Add some mini chocolate chips for a dash of indulgence, then dust with powdered sugar. For lunch, use that same cookie cutter to surprise kids with a heart-shaped sandwich in their lunchbox. And for dinner? We can't think of anything more perfect than heart-shaped pizza. Some local pizza parlors make heart-shaped pies just for Valentine's Day, so it never hurts to call! Or buy the dough yourself and shape it into a heart on your pizza pan before adding sauce, shredded cheese and your favorite toppings. Mixed Berry: "Have a Berry Good Valentine's Day!" Fruit Medley: "Orange You Glad We're Friends?" Tropical: "You're the Pineapple of My Eye!" Daddy Caddy: Buy a small carrying case and fill it with a bunch of handy items for dad to take on the go—like tissues, hand sanitizer, lens wipes and a mini notebook. 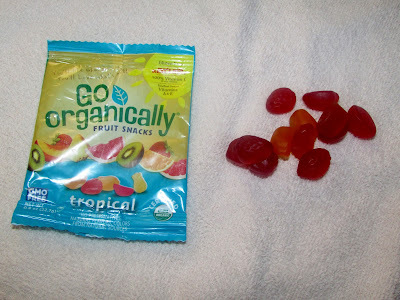 Add Go Organically Organic Fruit Snacks for a yummy snack dad will love. Mama Mixtape: Put together a custom CD or digital playlist with mom's favorite songs. Bonus points if they're love-themed. Kid Koupons: Create currency for your kiddos that can be traded in for special privileges—like breakfast in bed or a chore-free night. Teacher Treasure Box: Decorate a desktop trinket box for your child's teacher using colorful paint and stick-on gems. Fill it with useful teacher "treasures" like sticky notes, binder clips, rubber stamps and more. Be sure to follow Go Organically on Facebook for more kid-friendly ideas! Made with real fruit, the gluten-free, nut-free, dairy-free kids snacks are a great choice for your on-the-go life. One person will win three boxes of Go Organically Organic Fruit Snacks (one of each flavor). they all sound good but if I have to choose, then it will be Fruit Medley first and then the rest. Thank you for the information. I would like to try Mixed Berry flavor first. I would definitely try the mixed berry first! I have had these and the fruit medley is my favorite flavor. These would be a great gift option especially for diabetics to have a good sweet snack. They all sound good but I think we would try the Fruit Medley ones first. The tropical would be first choice. First I'd try their Mixed Berry variety. All the types look delicious. My kids would probably like mixed berry best! I would like to try the Fruit Medley. I would love to try the Mixed Berry flavor first! My kids would love these! My daughters would love the mixed berry flavor! The flavor I am most excited to try is the tropical variety of Go Organically Fruit Snacks. I want to try the Tropical falavor. I would love to try out the mixed berry flavor. I think I would like to first try the Fruit Medley. I would try the fruit medley first. I really want to try the Tropical flavors. We would try the tropical first! I would want to try the mixed berry first. They all sound good though. I would like to try the fruit medley. Thanks for the chance to win. I would love to try the tropical fruit snacks! I would pick the Tropical to enjoy first. I would like them all but Fruit Medley would be first choice. I think I would enjoy the tropical flavor. to try the Tropical flavor. I would love to try the Tropical flavor. Thanks for the giveaway! I think the Fruit Medley sounds really good! I would love to try the Tropical flavor first! I'd never heard of these before. Mixed berry would be the first flavor I'd reach for. I think would all get inhaled quickly but I think the Berry would disappear first. I'm in a mixed berry kind of mood. I'm sure my boys would gobble up any of them though. I want to try tropical! Mixed Berry for me that sounds amazing. I would like to try the fruit medley first. I'd like to try the Mixed Berry flavor. I would love to try the Fruit Medley first/most of all! Thanks for another great giveaway! I'd like the mixed berry! I would like to try the mixed berry. I'd like to try Mixed Berry first. I would love Tropical fruit. The Mixed Berry sound delicious! Thanks! We'd like the fruit medley. Would like to try the Mixed Berry first. All the flavors sound really good, but I would like to try the Tropical first. I want to try the tropical flavor first. I think I would love the mixed Berry. But they all do sound good. I would like to try the fruit medley. Thank you. Paula C.
I'd love to try the Mixed Berry flavor first. i want to try the fruit medley. it looks good. Mixed berry would be great. I think I'd like to try Fruit Medley first. But they all sound yummy! All of the flavors sound good. I think the mixed berry would be my choice if I had to choose one. I would love to try the Tropical flavor first. Tropical would be my choice! I would try the mixed berry first!! I would try mixed berry. Mixed berry sounds good to me. I would like to try the tropical first. The mixed berry would be my second choice. The kids would like them all. The mixed berry would be my choice. Love berries. I would try the Tropical flavor first! I'd like to try Fruit Medley. Berries make me happiest. I'd go with the mixed berry flavor! I'd most like to try mixed berry. I would like to try the tropical flavor first. I would like to try the mixed berry fruit snack.